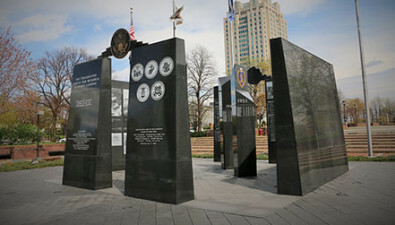 Korean War Memorial - J.J. White Inc.
JJ White was chosen as the general contractor for the construction of the Korean War Memorial at Philadelphia’s Penn’s Landing. The company brought the architect’s vision of thousands of American war veterans to life in a stirring fashion. JJ White has a long tradition of building historically significant buildings in the Philadelphia area, including the Liberty Bell Pavilion on Independence Mall. Company President James White’s father-in-law is a Korean War veteran, and when the opportunity to bid on the project appeared, JJ White jumped at the chance. JJ White had to build a memorial that both commemorates and explains the sacrifices made by each veteran of the Korean War. Close work with both the architect and the veterans themselves was necessary to put years of history into marble and concrete. JJ White also had to keep the sometimes hostile environment of skateboarders and vandals in mind when constructing the memorial. 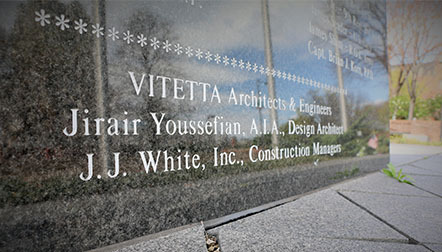 JJ White’s dedicated fabrication factory ensured that each of the memorial’s columns and parts were crafted at high standards of quality and durability. 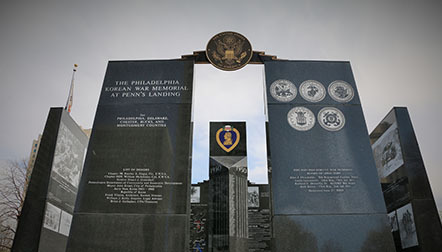 The company’s personal stake in the memorial guaranteed that the concerns of the veterans were at heart during each phase of construction. JJ White also maintained its flexibility when changes to the design were implemented midway through the project.